The previous time Ed had been in Mrs Turner apartment he hadn’t had to ring the bell, and so the old-style bells played by a speaker close to the door – a strange touch of modernity in what was otherwise a building with an overwhelming stench of oldness – made him start. The door soon opened, anyway, and when he saw the old lady’s usual sullen eyes he had already forgotten his unease. If all, the loud sound of the bell had had a good effect on him: he wasn’t nervous anymore. The adrenaline rushing through his veins had peaked his senses, and brought him back to calm. He had pretended to be bold and sure with Maggie, but in reality, he was scared by that woman and he feared her reaction, faced with the possibility that the ghost of the legend she had told him may have always been there for real, in the building, since the day it had died. There was nobody else he could have confided that matter, though. He wanted to know if there was a possibility to bring Maggie back to this world, a chance for them to be happy together, and it had been the old lady telling him there could be a way to break the ghost’s curse, weeks before. Being it Saturday, he had spent most of the morning home thinking about how to approach the lady. In the end, he had decided that going there around tea-time was going to be a good idea. It was already dark outside, in this time of the year, and he was going to need it. Or better, Maggie was going to need it. “Good afternoon, Mr Morrison, to what do I owe the visit?” Mrs Turner asked. “Good afternoon, Mrs Turner. I thought it was a good idea to have a tea with you,” he said, trying not to sound suspicious. The lady gave him a questioning sideways look. Her eyes, though, had already lost the usual grim she deserved to most of the people. This, at least, was a good sign. Then, the old woman turned around and went back inside her apartment, leaving the door open. Ed took it as a sign he was welcomed to enter, too. Once inside, he noticed almost everything was in the same state as the previous time he had been there. The library was still filled with books, but only this time he realized most of them looked very old, almost ancient. He couldn’t understand the titles, though, but the feeling coming from them was sinister. If he had to guess what was the inside of those books, he would say “problems”. He wondered if it had been a good idea to go there, but the feeling of Maggie close to him gave him courage. He diverted his attention to the wooden dresser on the opposite wall, where the photo frames lay in the exact same position he had left them weeks before. That single photo was still polished to shine. Others were covered in dust, but this time he was close enough to look at them. He picked up one and blew away the dust, uncovering a woman that could have been a young Mrs Turner, together with other people of similar age. Did she have siblings? He wondered, then he remembered the old woman had told him she wasn’t alone when she had heard Maggie in her youth. He picked up another photo and again, blew away the dust. This photo was newer, but the colours have been washed away by the time and the light. The woman in this photo was a younger version of the old lady, together with a woman who could have been her daughter. There was then a man, a boy in his teenage and a young girl – she may have been 3 years old. He had been so concentrated in those photos, that he didn’t hear the lady approaching him. She gently took the photo away from his hands. “You are young, you should not look at such things of the past, with an entire life ahead of you,” she said, sounding more relieved than worried about the the last ticks of her own clock. “And yet you have been,” she said. Ed thought he had ruined the mood already, but she nodded towards the small tea table near the window where two cups of tea were already waiting for them. “Pardon an old lady’s fun. It’s rare I receive a visit, this days, and I must have forgotten how to be a nice host, too,” she added, sitting in the chair in front of him. “It’s… It’s nothing,” Ed said, not knowing what he was supposed to say. They sipped the tea for a couple of minutes, in silence, looking out of the window. Ed didn’t know what to add, or how to start the conversation, and the old lady simply sat there, staring at him, without saying a word. He had the impression that if he had looked back at her, if he had met her eyes, she would have understood everything. After a couple of sips, though, the old lady spoke. When Mrs Turner used his first name, her voice had the touch of a grandmother scolding her nephew. He suddenly felt warm, relaxed, then he gathered up his courage and spoke. Ed stopped. He had prepared his talk for hours, and yet now the words simply didn’t come out. There was no way to circle around it, there was no way to prepare the old lady for what he was going to say. “What if I think I saw the ghost of the chained bride?” he blurted out. To his utter surprise, the old lady didn’t flinch. She looked at him with deep eyes for a while, then casually asserted. “I mean that your curiosity about that particular legend was a little too much. So I supposed you had witnessed something. The fact you are living in the same rooms where I heard those voices, when I was young, made it a possibility. So, did you hear her?” the old lady asked. “I heard her,” he answered. “And were you able to understand her words? You are a sensitive, empathic man, you could be able to do so if you concentrate enough,” she said. It was the truth, but still not enough for the lady to wince. She just looked at him, closing her eyes in a fissure as to try to find something in him, that was beyond what she could see. This time, Mrs Turner transformed. It was like she had had a rush of energy: her back straightened up and she appeared suddenly way higher and less frail than she had ever appeared to him. She stared at him now with wide-open eyes, piercing his soul with all her might for a couple of seconds. Then, she lowered back into the armchair and got back to be the usual, old woman Ed was accustomed to. He had never heard her voice so uncertain, almost pleading to tell her it wasn’t all the joke of a stupid boy. “Mrs Turner… Mrs Turner, please, calm down. Please… There is nothing to fear, nothing scary in her,” he said. But the old lady didn’t seem scared. If anything, she seemed genuinely excited. The moment had come. He had revealed his cards, he had revealed what was going on. There was just one thing to do, now. 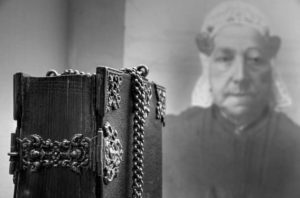 He had called the ghost to show itself, and from the moment the white fog had become appearing and aggregating between them and the library, the old woman couldn’t take her eyes off of that point. Her hands were trembling so much, thus, that Edward took from her the cup of tea she was still holding, put it back on the table and, with the care of a nephew for his own grandmother, took her hands between his. He had never had a grandmother. His grandparent had all died when he was too young to remember them, and now the contact with the cold, wrinkled skin of the woman gave him a strange sensation. And yet in that moment, as her hands slowly stopped to tremble, it was like comforting a baby that has just had a nightmare. “I… I can see her… And she is… So Beautiful… So… So… Sad… ” only now Edward realized the old woman’s eyes were lucid with tears. “I’m Margaret, and this is not the first time we meet,” she said. Edward recalled that, indeed, Maggie had all the memories of her time as a ghost. “Mrs Turner, can you hear her, too?” Ed asked. “Maggie… Margaret. There is no way I would forget this voice, there is no way I would forget the times I hear your desperate call for help,” Mrs Turned said speaking directly to the ghost. It was as if Ed wasn’t there anymore: for some time, they stared each other and just get accustomed to their presence. Ed had been worried all the time that Maggie would have never been able to become visible at will, for other humans. And yet the woman in front of him was able to see her without problems. “You may wonder,” the old lady said, “why I can hear and see you. You have no memories of your human life, haven’t you?” she asked. “All my memories are from my life as a ghost. The first thing I remember is my own body lying on a bed, in a sea of blood,” she answered. This revelation shocked Ed more than the lady. Maggie had never been so open with him, about her past memories. She had seen herself dead? How can a person’s memories start with such an event? He felt pity for her, sadness thinking of what she had had to live through. If her existence could be considered living, at all, anyway, bound to a world that wasn’t hers, cursed to live without a body. “You died giving birth to your child, and that child became a beautiful woman to whom they gave your name. And from that day onwards, your name had been passed down from generation to generation. I’m me, and yet I’m you. I’m Margaret Turner, one of your direct descendants,” the woman said with a rush of pride in her voice. “It’s been a long journey, but here we are. Today, the circle closes,” she said. Ed wondered what she meant. Even if they were meeting, nothing was changing the fact Maggie would have lived eternally, likely meeting other descendants of the old woman, too. If the photos were right, there was at least another Margaret, out there. “Why did I turn into a ghost?” Maggie asked. Mrs Turner had turned extremely serious now. Her tone more formal, in a sort of reverential respect for her ancestors. “I want to hear it, please, I need to hear my story. It’s been an eternity for me, living in the ignorance of who I am, of how I became like this,” she begged. In the old lady’s eyes, Ed could already see resignation. “You were born two centuries ago, supposedly in this very house or in another building under the protection of a Lord of that time,” she began, and then slowly unfolded the same story she had told to Edward weeks before. From his point of view, it was indeed strange how the woman often used the same exact words she had used when she had told the story to him. It was like listening to an old vinyl record repeating the same story over and over again. He wondered how may time she had listened to that story herself. But the truth was, it didn’t matter: the old woman was finally revealing Maggie about her past, and Edward focused on her reactions. The ghost, though, didn’t look surprised or sad, hearing the sad story of her life. Edward had the impression that Maggie was absorbing the entire story as a mere fact, not linking her own existence to the one of the poor girl of centuries before. It was her, and yet it wasn’t because she had no memories of those events whatsoever. When Mrs Turner finished the story, Maggie was almost in the same position of a couple of minutes before; her expression hadn’t changed either. She was the first to break the silence, though. “It’s ironic: centuries waiting for an answer to my questions, an answer to my existence, and now that I have it I don’t feel a thing. The girl you speak about… She is a stranger to me,” she said, bitterly. “It’s natural, it’s said ghosts never share a deep link with their earthly life, if we exclude the feelings they had in the moment they died,” Mrs Turner said. Maggie moved for the first time in a while, and slowly floated until she reached the side of Edward. “I think I came to know that, in the past weeks,” she said, caressing Ed’s hand, and while looking into his eyes she became so bright and clear that Ed thought she was going to become human again there, on the spot. The old woman sighed, looking at the smiles on both the lovers. When Edward noticed it, he thought it was finally his turn to speak. “Mrs Turner, I have a question. No… We have a question,” he said. The old lady seemed pensive for a while, but it was clear she was trying to recall something from her past, that could have helped them. “Yes, ghosts can do that if they feel emotions linked to the reason they had become like that in the first place, but it’s a pretty rare feat. For her to be able to control it at will… This is the first time I hear of something like that,” Mrs Turner said, and couldn’t hide some kind of uneasiness in her voice. Ed tried to query her furthermore. “We thought you may help us. You are the only person I know that is somewhat linked to Maggie, who knows her story and knows enough about her to keep organizing rituals every year,” he said referring to the candles ritual. His words sounded like a prayer. But the old lady stopped talking. Then she suddenly stood up and brought both cups back to the kitchen, and when she came back there was no more sympathy in her eyes, no more “welcome”. “Mrs Turner, I understand I may seem pushy, but if there is a way if we have a hope… I really need to know!” he stated, a little too abruptly to be considered polite. “How I am supposed to know? I’m no ghost!” the old lady shouted back, suddenly angry. Ed wondered what had happened, but he knew the old woman enough already to understand he wasn’t welcome there anymore, and so he wasn’t surprised when she spoke. “It’s time for you to live,” she added, her voice back to a normal tone. Edward didn’t understand the lady much, now, but he didn’t want to push her more. He reached the door, opened it. Maggie was now a faint light floating by his side and slowly disappearing. When he turned around to greet the old lady, though, Mrs Turner did something that felt tender, caring and yet strange like the sound of his name when she called him. He took the hand that was still tenderly cupping his head and put it away, lowering her stretched out arm. He felt the old woman was trembling again. She really meant her words. Edward thought some second, while holding her hand. He had already realized it long before: he knew that he would be happy only for some time, and he would eventually get old and die, while Maggie would stay like that forever. The real tragedy, was going to be hers – he thought. “I can’t do anything, but love her,” he said letting go of her hand. That seemed a strange thing to say. He was in love, he was going to be like that for his entire life, he was sure. Was that woman thinking he was such a naïve boy? Then he left the apartment, closing the door behind him. The woman didn’t move, though. “I know you are here, I feel you. Show yourself,” she said, and Maggie slowly appeared floating in front of her. Mrs Turner didn’t let her finish. “I told both of you, this can’t end well, already!” she hissed. Her voice was now breaking with emotion. The old woman didn’t look at the ghost again. She turned around and walked back to her living room, where she looked at the books in the library for a couple of minutes, until she found what she was looking for. She dragged down the old, heavy tome, and put it on the tea table. It had a leather, brown cover and an unintelligible title written in curvy, golden characters. Then she walked back to the wooden dresser and picked up the photo she’d previously took from Ed’s hands. She slid her old fingers on the dirty side, revealing the person she was hugging: a girl, in her late teenage. “Nothing I can do,” she whispered to herself. If you like this story, press the “like” button below and feel free to leave a comment here: an author always needs his readers’ feedback.